Wow! What a show to kick off 2017. In this episodes, we talk with Troy Peterson, long time real estate investor who has been investing for 10+ years. It was such a treat to have him on the show because he breaks down private lending in easy to understand terms. As an investor who has only used private lending to fund his deals, he shares great insight into where to find private money and how to structure those deals. None of his rentals have ever been purchased with traditional financing. He brings so much value to the show in shedding some light on the mystery of private lending. TO be honest, we hope that you learn from the questions we ask because we wanted to learn a lot about it as well. 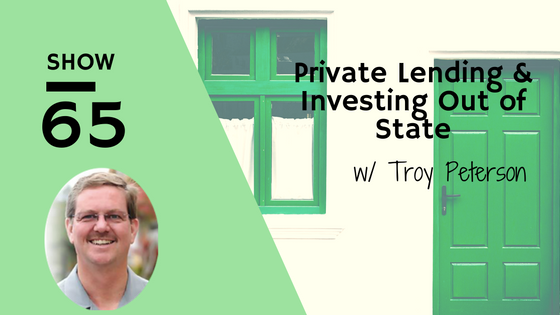 Not only does Troy bring us a ton of great information on the lending side, he also shares some insight into investing out of state. How he finds deals and why he finds it important to actually go and view the properties and areas himself. Having 'boots on the ground' in the out of state properties is definitely critical to finding success.